My tutor's comments: It shows that you enjoyed this drawing. 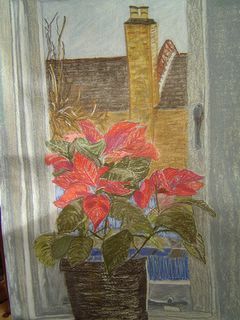 I like the way that the red and the green of the plant really seem to come forward against the mass of grey around it. But then I think that this is confused a bit by the blue, which also seems to want to poke through the gaps in the leaves. The grey seems to recede against the colours outside. If you look closely at that grey you could probably find other colours in it that might draw it forward. Here you have set up a picture with a foreground, a middle ground and a background; the plant, the wall and the outside. This is clear in the drawing but I think your use of colour doesn't quite fit the drawing. However just engaging in pushing and pulling colours around in space in this way is itself quite an achievemnt and if you can see what you are doing here and develop it then you have made a very good start. The language of areas of colours coming forward and receding is a very modernist one based on the ideal of creating a pure and harmonious composition from colour, it comes from artists like Cezanne who famously talked about "recording coloured sensations", Matisse and even Hans Hoffman, an American abstract expressionist who talks in terms of "pushing and pulling" colours. I think it would be useful for you to have a look at these artists if you are not already familiar with them and see if you can see what I am talking about. Having now seen several of your works, you are definitely developing a style and technique that is your own, whether you intend to or are aware of it or not. Of course, that doesn't mean that you can't branch out and do something completely different in order to stretch yourself even more.